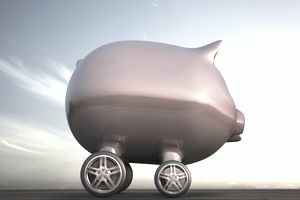 Owning a car is likely one of your largest personal expenses, and while it will always be one of the bigger expenditures on your personal budget, there are many ways to save big money on your car expenses. As with all personal finance, the more cost-saving measures you adopt now, the more money you'll save. While potential savings will vary widely depending on your personal situation, here are some of the best places to start saving money on your car expenses. Keep cars longer instead of trading every few years. Not only does the cost of new cars rise each year, but cars depreciate quickly, and when you trade frequently, you lose money on low trade-in values. Buy a good quality car and keep it for five to seven years. Potential Money Savings: $400 to $1,000/yr. When buying a new car, consider smaller models. They're often cheaper, and because they're lighter, they usually get better gasoline mileage. In addition, insurance is cheaper. Potential Money Savings: $400 to $600/yr. When buying a new car, consider the impact that various options have on fuel economy. For example, you sacrifice several miles per gallon when using air conditioning on the highway and even more in stop-and-go traffic; automatic transmissions get about 5 mpg less than manual transmissions; six-cylinder engines get about 4 to 5 mpg less than four-cylinder engines. Potential Money Savings: $400/yr or more. Don't buy credit life or credit disability insurance through your car dealer when purchasing a new car. Some dealers do a hard sell on these coverages, but they are highly overpriced, and if they're folded into your car loan, you not only end up paying 100% to 500% more than you should for the coverage, you also pay interest on it. Stick to regular life and disability insurance through your employer or an individual policy. Potential Money Savings: $300 to $500. Be extremely wary of purchasing service contracts or extended warranties on new automobiles through your dealer. Many of them have very limited coverage (in spite of what the salesman may lead you to believe) and they cost much more than policies purchased directly from providers like Warranty Direct (www.warrantydirect.com). Potential Money Savings: $500 to $1,000. Keep your car properly tuned. A poorly tuned car uses between 25% and 33% more gasoline each year. It's cheaper to pay the cost of a tune-up. Potential Money Savings: $150 to $250/yr. Change the oil and oil filter in your car every 3,000 miles, regardless of how often your owner's manual recommends. More frequent oil changes are the single most important factor in extending the life of your engine, and will more than pay for themselves in savings on repairs and engine wear. Potential Money Savings: $500 to $3,000. Check your car's air filter monthly. A dirty filter shortens the engine's life and reduces gasoline mileage up to 10%. You can clean the filter by removing it and blowing it with an air hose, or you can replace it. Potential Money Savings: $130/yr or more. Use steel-belted radial tires. This can increase your gasoline mileage by up to 10% per year. Potential Money Savings: $130/yr or more. Unless your car is knocking and pinging, don't use a higher octane gas than your owner's manual recommends. For most cars, premium gasoline offers no benefit. Unless your car has a high-performance engine and your manufacturer recommends a high-octane gas, use the less expensive gas. Premium gas costs 10% to 15% higher than regular. Potential Money Savings: $200 to $400/yr. Check your tire pressure regularly. You can lose up to 6% in gasoline mileage for every pound of under-inflation. Potential Money Savings: $140-400/yr. Add thousands of miles to the life of your tires by having them balanced once a year. In addition to destroying the tread, improperly balanced tires can wear out your shock absorbers and damage your suspension system, leading to more expense. Potential Money Savings: $175 to $250/yr. Check fluid levels regularly. Low battery water shortens your battery's life. Check coolant, automatic transmission fluid, and brake and clutch fluids. Potential Money Savings: $50 to $300/yr. Pump your own gas. Self-serve gas is usually 5% to 10% cheaper than full service. Potential Money Savings: $65 to $130/yr. Don't "top off the tank" when pumping gas. Some of the gas may end up overflowing when it expands in the sun or if you park on a hill. Potential Money Savings: $20 to $53/yr. Carpool to work. By sharing the driving with just one other person, you could save an average of $20/month or $200/year in gasoline alone if your commute is just 20 miles round-trip each day. Sharing the driving with two others increases your savings even more. Savings vary depending on the length of your commute. In addition to savings on gasoline, you'll save maintenance costs and wear and tear on your car. Potential Money Savings: $400 to $700/yr. Another benefit to carpooling is that it reduces the annual mileage on your car. Since this reduces the risk of accident, your insurance company may charge you less for your coverage. Just be sure to update the average miles you drive with your insurance company to get the savings. Potential Money Savings: $25 to $50/yr. Wasteful driving habits can double your fuel consumption. Develop gas-saving habits, such as: (1) always accelerate gently; (2) watch traffic ahead of you so you can anticipate slow-downs and avoid stops; (3) coast up to traffic jams by lifting your foot off the gas pedal instead of approaching at full speed and slamming on the brakes. It takes 20% more gas to accelerate to normal speed from a full stop than it does from four or five miles per hour; (4) don't drive too fast or too slow. It takes 20% to 30% more gas to drive at 70 mph than 50 mph; (5) maintain a steady speed on the highway. Avoid getting stuck behind slow cars where you have to slow down to their pace and then speed up to pass. Potential Money Savings: $390/yr. Don't warm your car up by letting it idle. The engine warms up faster when driving than it does when idling, and idling wastes about a quart of gas every 15 minutes. Potential Money Savings: $90/yr. Save fuel by combining errands into one trip and avoid backtracking whenever possible. Potential Money Savings: $25 to $100/yr. Ask your insurance agent how much money you can save by raising the deductible on your auto collision insurance. Often, raising the deductible from $200 to $500 can save you 10% to 30% in premiums. If you have a good driving record, you could come out ahead. Potential Money Savings: $50 to $225/yr. Make sure you notify your insurance company of all the safety features that qualify you for discounts on auto or homeowner's insurance, such as automatic seatbelts or airbags in your car, smoke detectors in your home, etc. Non-smokers or non-drinkers can often get additional discounts. Potential Money Savings: $50 to $100/yr. If you drive an older car, consider dropping collision and comprehensive coverage (don't drop liability coverage). Collision coverage is required if you have a car loan, but for older cars that you own free and clear, weigh the car's book value (what the insurance company would pay you if the car was totaled) against your collision premiums. If your car is over five years old or is worth less than $1000, keeping collision and comprehensive coverage may not be worth what you're paying in insurance premiums. Potential Money Savings: $100 to $300/yr. Before buying a new car, ask your insurance agent whether the model you are considering will require a surcharge due to higher theft, damage or repair costs. Potential Money Savings: $50 to $200/yr. Shop around for insurance. If you're getting good service from your company and are happy with the rates, you may want to stay with them, especially if you have had accidents or tickets. But if your record is good, shop around to see how much you can save, then decide if the savings are worth the switch. Potential Money Savings: $50 to $200/yr. Consider combining your auto and homeowner's insurance under one policy. Many insurers give a discount for multiple policies. Potential Money Savings: $50 to $200/yr. If you have a high school or college student under 25-years old in your household, ask about the good student discount for auto insurance. If your student qualifies, you could save 25%. Potential Money Savings: $125/yr. Avoid tickets for speeding or moving violations. Many insurance companies give a discount of up to 20% if you have not had an accident or ticket for three years or more. Potential Money Savings: $100/yr or more.